I can’t remember the last CEO, Managing Director or General Manager i met that was actually punctual to our meeting. Senior managers are sometimes on time, but usually only when their boss is attending the meeting. Must leaders always be late? Their lateness stretch from 15 minutes to sometimes an hour. I’m intrigue by many leaders’ sense of timing, and frustrated by the inconsideration towards everyone else that are waiting. The leader would sometimes call to have the meeting proceed first, but what happens when he arrives? He will ask the question that has been answered 15 minutes ago and the meeting is rewinded back to the top. Does lateness equal importance? 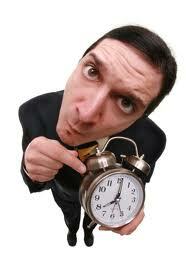 Do busy executives leading big companies have the right to be late because of their crowded schedule? Must leaders always be late? I found a story on George Washington on this topic written by Brett and Kate McKay (The Importance of Punctuality | The Art of Manliness) really reassuring and here are excerpts from the article. The life of George Washington was characterized by a scrupulous regard for punctuality. When he asked a man to bring by some horses he was interested in buying at five in the morning, and the man arrived fifteen minutes late, he was told by the stable groom that the general had been waiting there at five, but had now moved on to other business, and that he wouldn’t be able to examine the horses again until the following week. Benjamin Franklin once said to an employee who was always late, but always ready with an excuse: “I have generally found that the man who is good at an excuse is good for nothing else.” So if a President of United States can keep to his time, i wonder what excuses can the rest of us come up with for not being punctual? So let’s keep to our time, show respect for others, and build credibility to leadership.